Thanksgiving is one of our most cherished national holidays. It is a time to remember the sacrifices and contributions of the pilgrims at Plymouth Rock nearly 500 years ago. We’ll celebrate our national heritage with a feast like no other replete with foods that are produced or grown in the good old USA. With turkey (our “National Bird”) as the centerpiece of the meal, we will consume, among other culinary delights, a cornucopia of uniquely American dishes such as sweet and/or mashed potatoes, cornbread or chestnut stuffing, cranberry relish and pumpkin pie. So you might be surprised to know that the first wine I’ll lead off with to toast Thanksgiving dinner this year will be from … France! Why, you might ask, would I not celebrate this uniquely American meal with wine produced in our own country? Well, before you get your red, white and blue undies in a tangle, please know that I will be using American wines too – just not to begin with. You see, there is another date – Thursday, November 15 -that should have particular significance for wine lovers everywhere. 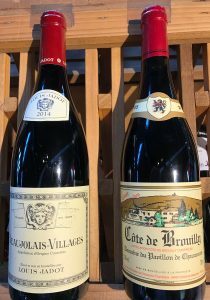 That’s when Beaujolais Nouveau – the first wine of the 2018 vintage – was released in France and is now available in the US- even here West Virginia. 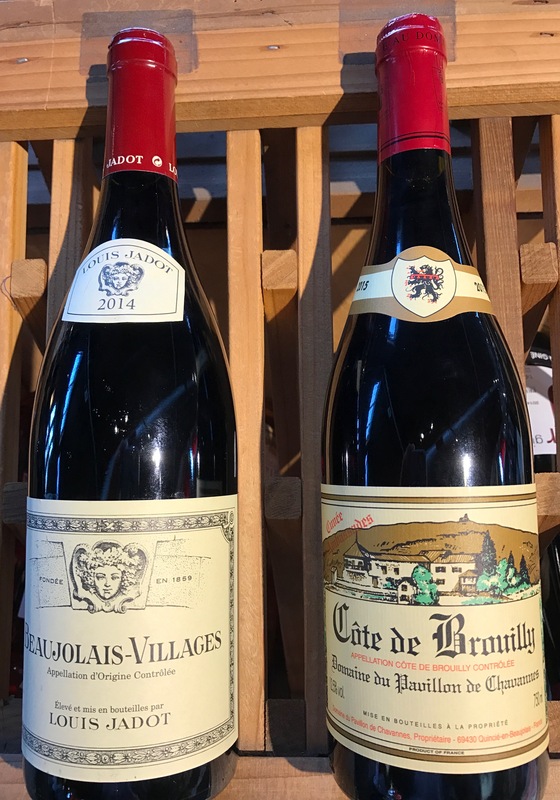 Beaujolais Nouveau is a fun sipper full of fresh strawberry and cherry flavors that is produced from the gamay grape, and it’s only two months old when it arrives in wine shops and cafes around the world. I plan on using the nouveau this year as an aperitif before our Thanksgiving dinner. After the Beaujolais Nouveau I plan to open a bottle of Trimbach pinot gris from Alsace for those at my dinner table who prefer white wine. I will also open an Oregon pinot noir for those who would like red. (I’ll have a little of each). For dessert, I will chose a bottle of Chateau St. Jean Late Harvest riesling to accompany the pumpkin pie, and then I’ll plop down on the couch to watch some NFL team hand the Detroit Lions THEIR lunch. You can really have fun selecting wines for Thanksgiving because the meal can be successfully paired with white or red, as well as light or full-bodied wines. That’s because turkey is blessed with meat that has different flavors, colors and textures. Add to this the manner in which it is cooked – from traditional oven baking, to deep frying, to grilling, to smoking (with hardwood such as apple) -and you have even more wine choices from which to select. Stuffing for the turkey adds a whole other flavor dimension which, depending upon the nature of the dressing, opens up even more vinous pairing possibilities. The traditional oven-roasted turkey with a mild sage dressing is very nicely accompanied by whites such as Alsatian riesling, California sauvignon blanc or a steely chardonnay like Chablis. For reds, you might try a Washington State merlot, Brunello Di Montalcino from Tuscany, or a Bordeaux blend from Napa. For those intrepid souls who choose to smoke or charcoal grill the National Bird, I suggest pairing this spicy, smoky meal with pinot noir from either California or Oregon, petite sirah or zinfandel from California or Chateauneuf Du Pape from France. And with dessert – whether it’s pumpkin pie and whipped cream or some other belly-buster- you might select a California late harvest riesling or a moscato from the Piedmont region in northern Italy. Here’s wishing you a very Happy Thanksgiving!